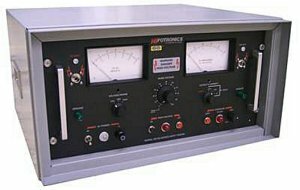 The HD100 Series Bench Top AC and DC Hipot Testers are accurate and durable instruments designed to perform hipot tests on all types of electrical products, system, and components. They are simple to operate and designed for use by unskilled or semi-skilled personel in production testing for AC and DC dielectric withstand testing. The AC/DC output configuration eliminates the need for purchasing separate AC and DC hipots. Output connected voltmeter ensures accurate voltage measurements regardless of output loading. The instrument is capable of testing to most industry specifications such as UL, CSA, VDE, IEC, and MIL for dielectric withstand testing. Continuously adjustable test voltages from zero to rated voltage. Adjustable Overload from 10% to 110% of rated current output. Audible / Visual alarms provide a clear indication of overload situation. Zero start interlock ensures that voltage control is at zero before HV can be energized. Shorting solenoid grounds output cable and object under test. Two Tests in One Unit - eliminates need for purchasing separate AC, DC Hipot. Operator Safety - the power supply and test object are automatically grounded when high voltage is turned off. Meets Industry Specifications - tests to most UL, CSA, VDE, IEC, MIL for dielectric withstand testing. Rack Mountable - easy installation into a 19-inch rack.